Mission: Mars, by Pascal Lee. Scholastic, 2013. What if we started to train the astronauts of 2035 today? Pascal Lee does just that in his kid-friendly training guide for would-be Mars explorers. Lee, a planetary scientist with the Mars Institute and the SETI Institute, explains what it will take to send humans to Mars — from spacesuits and exploration rovers to surviving subzero temperatures and raging dust storms. By showing the latest designs and plans for the Mission, Lee helps readers envision the possibilities, focusing on a future in which they can partake, rather than on accomplishments of the past. Readers are also introduced to research being done at NASA and around the world. 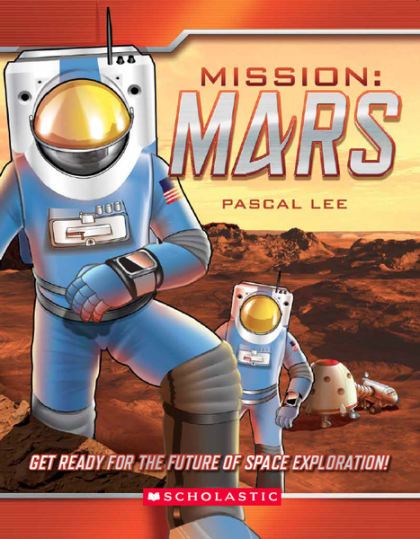 Mission: Mars is also visually strong; the colorful illustrations are engaging, informative, and complement Lee's enthusiastic and infectious text. The book, written by a scientist who is a major player in the endeavor, is sure to inspire the next generation of space explorers. Pascal’s interest in space began at an early age. When he was six, he built his first “spaceship” by putting a laundry basket on roller skates. Early test flights, often co-piloted with his younger brother, did not always end well. He refined his skills by studying physics and geology at the University of Paris in France. He continued on with a PhD in astronomy and space sciences at Cornell University in New York.